Do your eyes get red, sore or blurry? You may have dry eye or blepharitis. Dry eye as viewed with a special diagnostic dye. The speckled surface is where the eye has been damaged due to drying out. Irritable eyes are a common problem for New Zealanders. Most often this discomfort is caused by either dry eye or blepharitis. The term dry eye is used when someone's tears do not keep their eyeball wet enough throughout the day. Blepharitis is a medical term that means inflammation of the eyelids. Often dry eye is caused by blepharitis and vice-versa. Bay Eye Care runs a dedicated dry eye and blepharitis clinic to look after people suffering from these bothersome conditions. We use a range of cutting-edge technologies, including TearLab tear chemistry testing, to assess your ocular surface and eyelid health and employ specialty treatments to manage the underlying cause. We are the first eye care practice in the Bay of Plenty to have an IPL device to treat dry eye syndrome. Observing rings of light shone onto an eye gives us valuable information about your tears and how dry your eyes are. The distorted rings in this image show this person has moderate dry eye. Because the treatments for each type of dry eye differ it is important for us to accurately diagnose your condition and its severity. At Bay Eye Care we use range of specialised diagnostic equipment, patient questionnaires, digital photography and clinical knowledge to gain an in-depth evaluation of your ocular surface. This animation shows the effect of abnormal tear film chemistry on the ocular surface. At Bay Eye Care we use The TearLab osmolarity system to check for a higher level of dissolved salts in your tears, a proven bio-marker for dry eye disease, and a cause for ocular inflammation. This video shows how the thickened oils in the eyelid of a patient with MGD can be released by your optometrist with a in-office technique. However one of the most exciting therapies to improve dry eye in MGD patients is intense pulsed light (IPL), a treatment exclusive to Bay Eye Care in the Bay of Plenty at the time of writing. Alex about to use our IPL device to treat dry eye. The difficulty with most dry eye treatments is they have to be continued each day to stop the symptoms returning. Intense pulsed light (IPL) is a revolutionary new treatment that is painless and long-lasting. At Bay Eye Care we use a IPL device specially designed in France for treating dry eye. Treatments consist of 3 or more sessions over 6 weeks where we apply intense pulsed light to the skin around the eye. The treatment stimulates the glands in the eyelids to improve their secretions, improving your dry eye. A study from Auckland University using the same IPL device that we have at Bay Eye Care showed that after only two treatments 86% of patients had noticed significant improvement in their symptoms. Typically people treated with IPL find sustained improvement in their dry eye for over 6 months. You can read a case report about one of our patient's successful treatment with IPL at Bay Eye Care here. Most patients do require re-treatment however when their symptoms return to a bothersome level. More information about the costs of IPL therapy can be found on our Bay Eye Care Fee Structure page. Visit our IPL for dry eye page here. 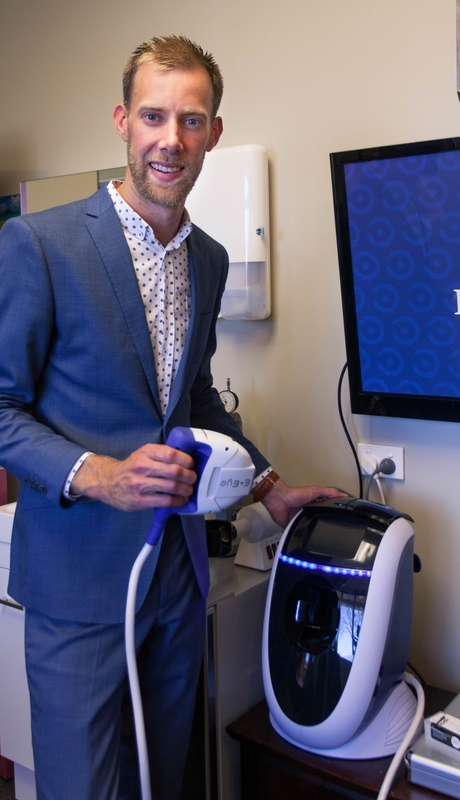 A recent report on an Australian current affairs show gives insight into the suffering dry eye can cause and how the IPL treatment available at Bay Eye Care can help. This condition is not as common as evaporative dry eye or MGD. It is due to decreased production of the watery component of the tears from the lacrimal glands in the eye. Aqueous deficiency is most frequently associated with auto-immune diseases (such as Sjögrens Syndrome and rheumatoid arthritis), following laser eye surgery, radiation or chemotherapy, and the use of some medications including antihistamines, nasal decongestants, tranquilizers, certain blood pressure medicines, Parkinson's medications, birth control pills, hormone-replacement therapy and antidepressants. The incidence of this type of dry eye also increases with age as we naturally produce less tears. This collection of images shows a large scleral contact lens used by a patient with severe dry eye. This lens allows him to drive and live a more normal life. Treatments for aqueous deficient dry eye involves increasing the volume of lubrication in the eye with particular eye drops and nutrition, decreasing the inflammation associated with a dry ocular surface and retaining what little tears are present by blocking the drainage channels in our lids with plugs. Severe dry eye can also be managed with scleral contact lenses. These specialty lenses protect the eye surface with a reservoir of tears, offering relief where all other options have failed. The typical appearance of a patient's eyelid margin with anterior blepharitis. An entertaining video about demodex blepharitis and the management strategies that we use at Bay Eye Care for this condition. Blepharitis is a general terms for chronic inflammation of the eyelid margin. It is a common cause of dry eye disease. Symptoms include irritated, red, itchy or stinging eyes and eyelids, as well as variable vision. Anterior blepharitis is a sub-type of this condition generally caused by an over-colonisation of microorganisms along the lid margin, particularly along the eyelashes and the eyelash follicles. These microscopic creatures release toxins which trigger inflammation along the eyelids. One organism that can cause blepharitis are Demodex: small mites that live on our skin and hair follicles. Demodex mites are more common on our bodies as we get older; they can be found on everyone over the age of 70! Demodex are resilient to conventional treatments and require a more specific approach, often involving tea-tree oil. Examination of the eyelashes under microscope is often needed to visualise the mites and make the diagnosis. A demodex mite from on of our patient's eyelashes seen under the microscope. Treatments for anterior blepharitis typically involves daily lid hygiene with a eyelid scrub such as Sterilid or Oust. Many patients with moderate to severe blepharitis benefit from BlephEx micro-dermal abrasion treatments, carried out in the practice by our therapeutic optometrist Mr Alex Petty. These treatments use a medical grade rotating micro-sponge to remove stubborn debris and organisms along the eyelid margin. Like dry eye, blepharitis symptoms will return if treatments are stopped, so ongoing routine management at home is required. The effect of using the BlephEx treatment available at Bay Eye Care to clean the lid margin of debris.